The tenth day of the Navaratri festival is known as Dussehra. It's widely devoted to honoring the defeat of the demon king Ravan by Lord Ram. Every year on Dussehra, colorful effigies of demon king Ravan are burned to mark the defeat of Ravan by Lord Ram. However, the festival is also celebrated in fascinating different ways in different parts of India, as these Dussehra pictures show. 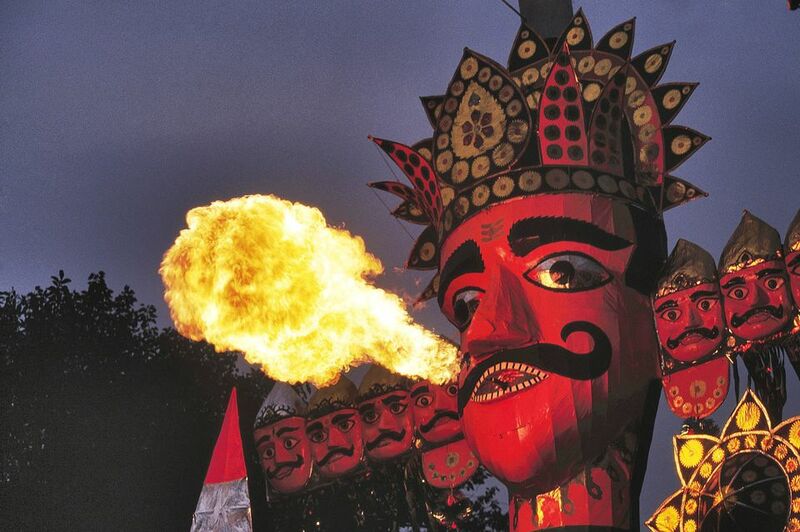 In Delhi, most Ravan effigies are made in an area called Titarpur, located in Tagore Garden in west Delhi. A famous makeshift market gets set up on the footpath there, along Najafgarh Road. It's worth a trip to see it during Navaratri (the lead up to Dussehra). However, the work on the effigies starts much earlier, in August. For three months, artisans work night and day to create the giant demons. It takes 10 to 12 days to complete three effigies. In the lead-up to Dussehra, Ramlila performances that reenact scenes from the much loved Hindu epic the Ramayana, which tells the life story of Lord Rama, are held. They culminate with much fanfare on the last night, with the defeat and destruction of Ravan. Here are 5 Popular Ramlila Shows in Delhi. In Almora, in the Kumaon region of Uttarakhand, a highlight of Dussehra is a popular street parade through the town. The Dussehra parade in Almora doesn't only feature effigies of demon Ravan. It has numerous other villains from the epic The Ramayana. The effigies are made by various local groups in the region, and are accompanied on the parade by traditional dance troupes and much fanfare. After being paraded through the streets of Almora, the effigies of the demons are set alight by the crowd. Apparently, 33 effigies of Ravan's family members are burned. It's the only place in India where this happens. In Allahabad, in Uttar Pradesh, traditional Dussehra celebrations involve the performance of the Kali Swang dance by a Hindu dressed as a fierce sword-wielding Goddess Kali. The procession weaves its way through the streets of Daraganj. According to Hindu mythology, there were occasions when Ram's wife Sita took the form of Kali. In the Kullu Valley region of Himachal Pradesh, there is no burning of Ravan effigies. Instead, Goddess Hadimba is carried from her temple in Manali down to Kullu, where she's taken to the palace and blessed by the royal family. She then goes to Dhalpur and is joined by the idol of Lord Raghunath (Lord Rama, the presiding deity). Hundreds of goddess deities from all over the region are brought out and carried in procession to see her. Musicians play trumpets as part of the Kullu Dussehra festival, to celebrate the triumph of Lord Rama over demon king Ravan. It's believed that the chariots are powered by the gods. All the deities remain at the Dhalpur Maidan fairgrounds until the end of the festival. In the Bastar district of Chhattisgarh, Dussehra celebrations last for more than two months and are devoted to the local goddess known as Ma Danteshwari. During the ceremonies, the tribes gather around the Maharaja of Jagdalpur, Kamal Chandra Bhanj Deo. On the last day of Dussehra celebrations in the Bastar district of Chhattisgarh, there's a fascinating parade featuring the Maharaja and all the tribes. Here, Maria tribal dancers participate in the parade on the last day of Dussehra celebrations in Chhattisgarh's Bastar district. The very unusual 10-day Dussehra festival at 300 year-old Mutharamman temple, in Tamil Nadu's Kulasekarapattinam village, requires pilgrims to dress up as gods and goddesses (or animals!) of their choosing. Mutharamman temple is dedicated to ferocious Goddess Kali. Devotees channel her spirit and dance in a volatile throughout the night, holding flaming clay pots in their hands. The Dussehra festival at Kulasekarapattinam culminates with a theatrical slaying, on the beach, of demon Mahishasura by the Goddess. It's definitely on of the most astounding spectacles in India! Mysore Palace is dazzlingly illuminated by almost 100,000 light bulbs during the city's 10 day Dussehra celebration, known as Mysore Dasara. The festival ends with a regal procession through the streets from Mysore Palace, featuring an idol of the Goddess Chamundeshwari and decorated elephants. Read more about Mysore Dasara.